As a young child, Louise Nevelson (1899-1988), born Leah Berliawsky, immigrated to the United States from Kiev, then part of the tumultuous Russian Empire (and the capital of present-day Ukraine). She and her family settled in Maine, where she adopted the more American name, Louise. After her 1920 marriage, Nevelson enmeshed herself in the New York art scene, but it was not until the 1950s that she began garnering the acclaim we now associate with her career. 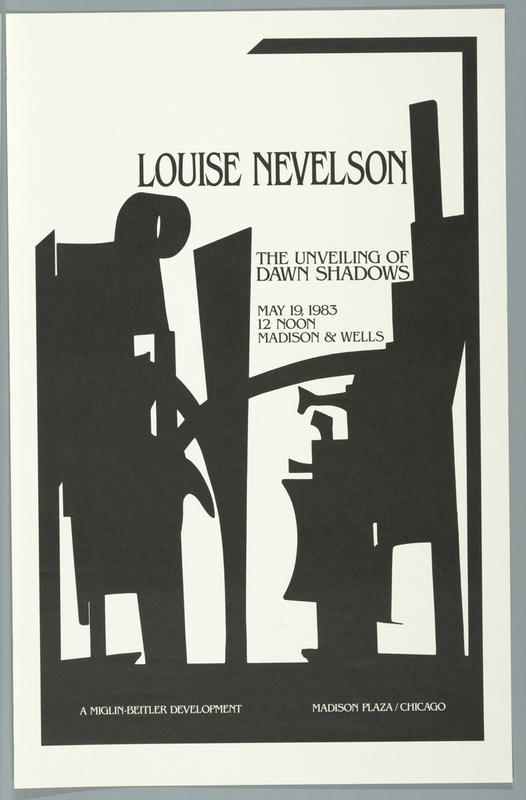 In this poster advertisement for Nevelson’s monumental public sculpture in Chicago, Dawn Shadows (1984-30-1), an image of the sculpture is silhouetted dramatically against a white background. The restricted color scheme heightens the drama of the title and indeed of the yet-to-be-unveiled 30-foot tall sculpture. As the almost Gothic poster intimates to viewers, Nevelson’s work is a bold embrace of the language of abstraction, made all the more intriguing given the masculine connotations of the material with which she produced Dawn Shadows-metal-and the formal qualities of her work that align with Abstract Expressionism. She was one of the first artists I became aware of as a young girl, she shocked my Midwest sensibilities at about age 8 and I knew that she would influence me all of my days as she has.